What this real bangkok lifestyle is like!!!. if you love to seek new experiences in real Thai culture and hospitality within the local-oriented area that few tourists have yet to discover ; then, please come and joy us to discover some of the best kept secrets. 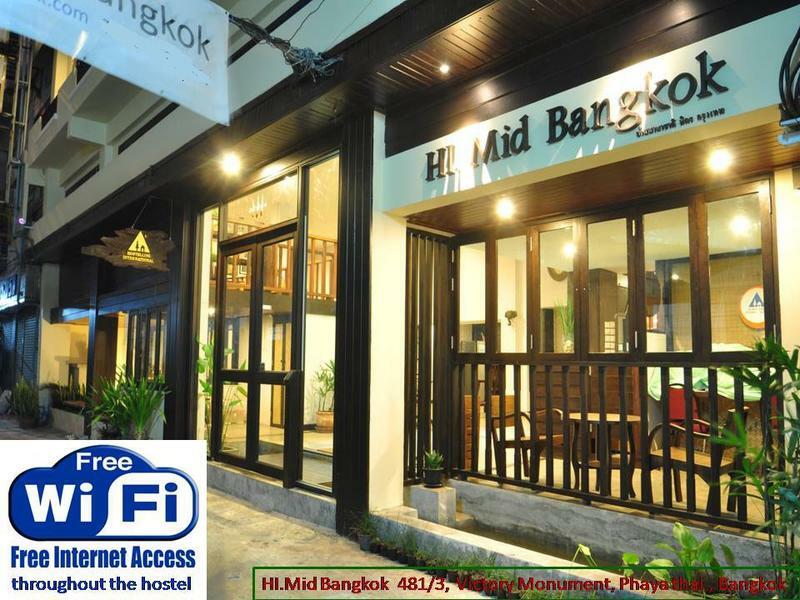 Located a stone's throw from the Victory Monument, whether you're going to Northern, Western,Eastern and Southern Bus Terminal or flying from both airports, HI.Mid Bangkok makes a good hub for Bangkok excursions. -Bangkok's notorious Skytrain network (BTS),helps you beat the Bangkok traffic jam, and public bus lines extending throughout the entire metropolitan area. And conveniently to both Airports. ---> to the western part: floating market, Hua Hin, Cha-Um, and tiger temple. ---> to the eastern part: Pattaya, Coral Island, Samet Island and Chang Island. -HI/YHA members. Please contact hostel directly to apply for 10% discount before booking. -We accept cash only. FULL PAYMENT is due upon arrival. -Passport is strictly required for check in. -Deposit 10% is NON-refund. or if you cancel any night, your deposit for that night will be loss. -NO charge if guest makes a cancellation by writing AT LEAST 2 days before arrival. -ONE night will be charged if guest fails to cancel LESS THAN 2 days before arrival. Take the City Line from the airport to Phaya Thai, last stop for Airport Rail Link. Then either walk (15 mins) , heading to Victory Monument or transfer to Sky train.(BTS). Take Sky train heading to Mo Chit. Get off at Victory Monument Station ( 1 station from Phaya Thai Station). (in total THB 55. thb15 for BTS, thb 45 for Airport Rail Link,) Then walk to Victory Monument at Fashion mall conner.